Stacking The Shelves is a weekly meme hosted by Tynga's Reviews. Ahhh, can you believe it? Christmas is in TWO days!!! I know Santa has been dropping packages off at my doorstep and hope he's doing the same for you. Any who, let's talk about books, baby! *The Farm Blog Tour AND Giveaway. Woot! *Waiting on Wednesday featuring books by C. Desir, Robin Benway, and Lynn Joseph. *Top five reasons why you should add EASY to your Christmas list (and a GIVEAWAY!). That's all, folks! From all of us at Addicted 2 Novels (i.e. Dexter, Skittles, and me), we want to wish you guys a fabulous holiday. Feel free to link your mailbox posts in the comments below! Such pretty covers! I haven't read any of these but I can't wait to check out all of them! I hope you enjoy everything you got this week. looks like u got great stuff! enjoy! Oh, I've been wanting to read Let the Sky Fall, can't wait to hear what you think of it. 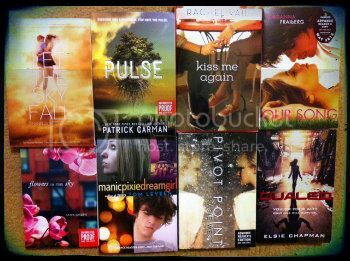 i got Pivot Point & Dualed too, excited to read those! The other titles look great! Awesome haul! You have an amazing haul this week! <3 Really want to read LET THE SKY FALL and PIVOT POINT. Read Dualed, am on the fence about it so I'm interested to see what you think! I really cant wait to read Let the Sky Fall ! !and Our Song sounds cute!! I've seen Kiss Me Again a few times today. let me know how you like it. huggle squish those two kitty cats for me! I also have a copy of Dualed. Let's hope it's as great as it looks. I don't know some of those! Off to investigate. Thanks for sharing. Enjoy.